may house more than a dozen people. Job opportunities are virtually non-existent. Winters are bitter cold and visits from health care workers are sporadic at best. At the end of each month, children and Elders often go hungry. 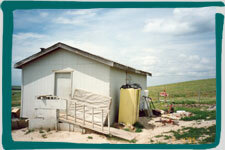 Many homes lack central heat, running water, electricity, and telephones. If you thought these conditions didn’t exist in America today, you are sadly mistaken. In fact, 14,500 enrolled tribal members of the Sioux tribe live on the Pine Ridge Reservation in South Dakota, which includes the two poorest counties in the U.S. Despite the obstacles, Indians remain devoted to their communities and determined to preserve their cultural heritage. 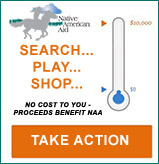 Native American Aid (NAA) sponsors programs that help these proud people rise above the poverty and isolation of reservation life. These programs address a wide variety of needs among children, adults, and Elderly Native Americans on the Northern Plains. To support these programs, NAA seeks donations from caring people throughout the country. In addition NAA obtains donated supplies from corporations and gift-in-kind charities, from soap and shampoo to diapers, clothing, blankets, food, and more. How can I help? Assists impoverished seniors by providing toiletry items, under clothes, blankets, and other basic necessities. 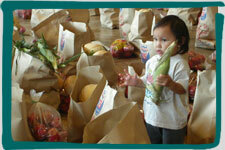 Volunteers of all ages help sort and distribute goods in their communities. Unlike many charitable groups, NAA insists that substantial community volunteerism be a part of the processing or distribution of these goods. 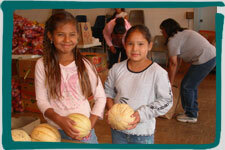 Volunteerism is key to strong, self-sufficient Native American communities. This unique relationship ensures that NAA addresses the genuine needs of a community. The programs are more like a partnership and less like charity. Program Partners are the linchpins of the NAA Way. These volunteers from reservation communities work side-by-side with NAA staff to plan and implement programs where they live. They identify needs, recruit other volunteers, provide community contacts, and reserve facilities for events. faces brighten when a truckload of healthful fruits and vegetables arrives. Volunteers of all ages carry out much of the preparation and distribution work associated with NAA programs. They give their time to help with projects such as sorting bulk deliveries of household products, delivering food to homebound Elders, or packing comfort items for children in foster care. Program volunteers receive incentive items such as baby food, clothing, and personal care items to thank them for putting forth the extra effort to improve their community.